June 1, 2007, 12:50 PM · NEW YORK - Welcome mistakes. Nothing is good; nothing is bad; it's all just information. I think that was my favorite point made by Indiana University professor and Pre-College Director Mimi Zweig in her pedagogy sessions at Juilliard's Starling-DeLay Symposium on Violin Studies. "If we can put ourselves in a non-judgmental environment, we can play better," said Zweig, with a smile. She actually said everything with a smile, even with the heavy drilling from Juilliard's major construction going on in the background. "Practice correcting mistakes with no stress." She also pointed out that all mistakes occur between two notes. One simply has to isolate those two notes and then figure out how to get from one to another. Once that is accomplished, "it's a matter of repetition without anxiety." The best way to start with any student is to make sure they are using their bodies properly for playing the violin. "Sometimes we forget that our body is involved in playing the violin," she said. "Everything we do with our body has an effect." And she meant everything. She suggested being aware of all joints in the body: elbow, wrist, knees, knuckles, ball and socket of arm, jaw, ankles, toes. When a student comes with a problem in, say, the left hand, it is important to look for the one main thing that will correct the problem, not for a million tiny adjustments. A student might have a thumb that is too high, or two low, or other matters of wrong alignment in the wrist. These problems must be targeted accurately before much progress can happen. "I find it very difficult to move forward with a student if the physical setup doesn't enable them to," Zweig said. Of shifts, Zweig said, "It's about knowing every part of the way to get there." She compared making a shift to getting to New York: taking the train, then getting to the school, going up the steps and elevator, taking a wrong turn in the hall. The first time took a lot of thought, but now she knows the way. Zweig spoke about the Kreutzer etudes, putting them the context of a plan for the pre-college student. "Kreutzer was a genius; these etudes are very well planned," Zweig said. "Each etude feeds to the next etude to the next etude. If we use these in the way he laid them out for us, by the time we get to 42, our students can do anything we ask them to." For example, Etude 5 can be used for mastering ricochet, which is done at that stage because "you can't do this bow stroke if you have any tension in your hand. Or in your knee, or toe." It helps ensure that the student is not developing a stiff grip on the bow. 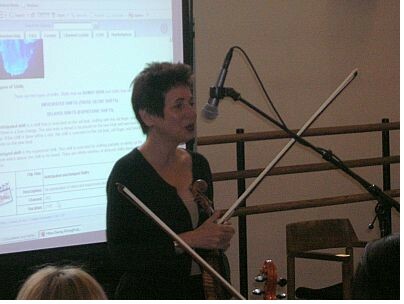 Zweig goes through all the Kreutzer etudes on her website, stringpedagogy.com. June 1, 2007 at 09:30 PM · Hi Laurie. Great job, and keep up the good work! Did any of the teachers allow a Q.&A. period? In my experince in attending master classes I found it very rare - Joseph Silverstein being a notable, and most welcome exception. I'd have taken issue with one or two things Simon Fischer and Mimi Zweig said - or at least wanted to question them to clarify a couple of points. June 2, 2007 at 05:09 PM · Yes, keep it up, this is all wonderful and definitely growth-oriented for all. Is this the one at Indiana that Rebecca Henry also runs? I was considering that for next summer, and I wanted to know if you have attended that one, too? June 4, 2007 at 12:41 AM · I should add though it is probably easier for a teacher to push students to play hard pieces than polishing the ealier ones. I believe the latter demands more detailed work as well as technical and musical abilities from the teacher, as the latter would likely to involve more of fixing some stubborn bad habbits while the former mostly aims at finishing the piece. June 5, 2007 at 03:22 AM · I especially like her comment that mistakes are neither good nor bad, just useful information. Thanks again, Laurie, for sharing with us all these wonderful insights.